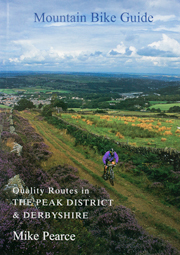 The Mountain Bike Guide - local books - The Peak District and Derbyshire - local books. There are many interesting books published on all aspects of Derbyshire and The Peak District. These are a few of my favourites or ones I think might be useful for visitors to the area. To purchase any item shown below just click on the 'Buy from Amazon' link. This will open a new window showing that item on Amazon's web site from where you can purchase the book via Amazon's web site. An indispensable guide to the area's archaeology.